Portland detective Archie Sheridan, the former head of the Beauty Killer Task Force, hunted Gretchen Lowell for years before she kidnapped him, tortured him, and then let him go. Now that she is behind bars, Archie is finally piecing his life back together. He has returned home to his ex-wife and their two children and sworn off visiting Gretchen. Though it should feel like progress, being away from Gretchen makes him feel worse. When the body of a young woman is discovered in Forest Park, Archie is reminded of the last time they found a body there, more than a decade ago: it turned out to be Gretchen's first victim, and Archie's first case. The body can't be one of hers. She's in prison. Then the unthinkable happens: Gretchen escapes and, while the city is on edge, Archie is secretly relieved. He knows he's the only one who can capture her, and once he does he now has a twisted plan to get out from under her thumb for good. 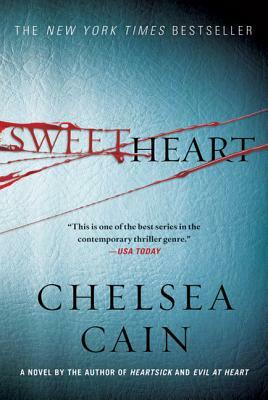 Each new novel in Chelsea Cain's scorching bestselling series—Heartsick, Sweetheart, Evil at Heart, and a new novel coming in 2011—is a dark, thrilling, and unparalleled tour de force.